Why should I have a monster? This area will explain reasons for having your own robotics monster, and will give you some insight into my own robotic monster. horror and disgust filled my heart." The whole idea behind the Frank N. Stein project is for people to create new types of robotic creation and at the same time have a lot of fun with it. A project like this should be to explore new ideas and let your imagination run wild. Not another smart run-about robot, but a monster. Your risk for failure in this type of project is big, but your pay off is even greater. Because one day you could have your robot following your orders to take out the garbage and the like and answer you with those precocious words, "Yes Master" or "Danger, Danger Will Robinson!" Now the ideas behind building a humanoid or Humanly Capable Machine (HCM) are solid. I think to really have a chance to succeed you need to find a mix of solutions and ideas from solid models like this from fellow member William Gale, your imagination, and junk. Lots of junk! Everyone will need to find their own mix of theory and junk that suits what they want to do or what problem they want to tackle with their creation. I hope everyone out their who is working on similar projects will submit articles for this area or send links to informative websites! If Wally looks a little junkie that's because he is. I am trying to use junk in Wally when practical because the odds of me designing something like this right the first time are slim to none. So am building him to be good enough as a prototype so I can learn. If some of my ideas for his brain and "back packing" intelligence pan out then I'll build a Wally II. You'll notice I have used two trash cans for Wally's body. This was for good reasons. For one the plastic is strong and saves time and money from building with wood, steel or aluminum. It also adds to the look of my robot. The lower trash can will hold any a future Single Board Computer or SBC and the top will cover the other electronics. This is a practical design for what I wish to do. The top trash can allows for easy attachments of arms and the head. It also allows me to build a shelving system for electronics that the trash can covers and this allows easy access of all parts. When transporting Wally up a stair case I found he did not have a very strong back bone as he snapped in half. A support bracket made of wood is being added to the back of Wally which will also double as a handle for lifting him. Wally may not look like much but he can take a licking, he fell down a few stairs and is still kicking! Wally has now become a Borg Drone and the Borg Drone has given way to T.J.
My Borg Drone is my new experimental computer controlled robot. My goal is to work toward the creation of a DAS-R. 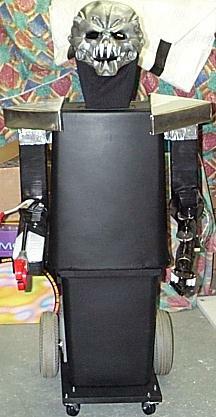 The first pictures shows an outdated version of my Borg Drone. The body was a rolling shelf cart. The second picture shows my Borg Drone as it stands today. However, it is going to be re-build to withstand force impacts and falls. The motors and wheels used are wheels chair motors. I bought them for $125 from another robot builder a couple years ago. 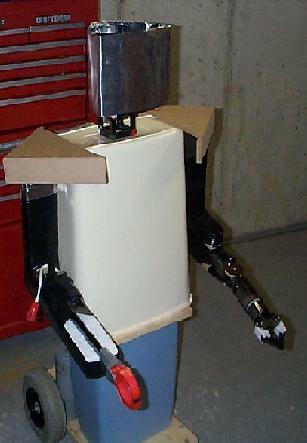 Wally was my old computer controlled robot who had an unfortunate accident down a flight of stairs. Wally has sort of died, sad to say. However, Wally is lucky because he's a robot and I'm bringing him back as DAS-R. DAS-R stands for Defensive, Artificially intelligent, Security-Robot. DAS-R will be incorporating a whole new designs philosophy of design to create robots for military applications. DAS-R will be armored to an extent to prevent damage from falls, collisions and weapons such as baseball bats. DAS-R's weapons will include a club for hitting back, a stun gun, a laser tag gun for simulation of gun fights and a small cutting saw for cutting through chains and locks. The smaller things I develop for DAS-R or in the process of working on DAS-R I will share here with everyone on the net, as I have been up to this point. However, some of things I might start leaving out because I'd like to turn DAS-R into a marketable robot in the future. This is something I take seriously, although the humor used through out this site might suggest otherwise. Some might ask, WHY make an armed military robotic solder? To answer that I point to the resent conflicts in Bosnia and Kosovo. The United States military forces in conjunction with the United Nations feel obligated to police certain regional conflicts that do or could conceivably interfere with our greater notational security concerns, the security of our allies and or the protection of basic human rights. In our current social and political structure it is not desirable to lose human lives in the process of helping other countries resolve their conflicts. In most cases that means sending in inadequate force numbers into combat situations which are changing minute by minute, such as in Bosnia. Or it results in hold back ground forces while waging an air war, such as in Kosovo. In Kosovo small numbers of enemy forces were able to effectively drive out a largely unarmed and defenseless population of ethnic Albanians. The Albanians were run out because they had no army to protect them. While air strikes were causing damage to enemy military infrastructure and economy, the real threat to the ethnic Albanians were the solders running them out. Those solders were not largely hurt because it's hard to bomb small groups of people hiding in builds and forests with fast moving jets. The result were countless innocent people forcefully made to leave their homes and country. They were allowed to return after the air war was over and enemy forces left the Kosovo region. But what I ask is could it have been done better? If ground forces had been sent into the Kosovo conflict they would have assuredly suffered casualties and perhaps would have caused a stalemate or even a prolonged and expanded war. But imagine for a moment it were possible to air drop platoons of robot solders. Each platoon would be comprised of about 20 robots. Each robot would have a rugged drive system, much like a 4X4 personal ATV's. In fact that is what my DAS-R will eventually use for a drive train. Robots could run on a combination of gasoline/battery/solar power. Each robot would have a fully function arm to pick weapons up off the ground or to open gates and doors. Robots would also have a gun type arm and tear gas launcher. Robots would be linked to a mobile remote command center for command instructions. Robots would have counter threat A.I. to automatically carry out preprogrammed maneuvers. Target destination and lethal force reaction commands would be issued only by human controllers. When you break it down DAS-R would be a smart mobile gun station in many ways. The benefit of DAS-R systems would be in having a truly expendable expeditionary force. In Kosovo platoons of robots could have covered open areas, creating a line to which enemy forces could not progress un-harassed. Platoons could have formed firing squads which could support one another with weapons fire. A defensive posture such as this would have forced the enemy to come out of hiding in large numbers to counter such a threat if enemy forces wished to proceed with the forced removal of the ethnic Albanians. Once the enemy forces were out in the open standard air craft could have been employed to destroy enemy targets. This is a small part of my vision for DAS-R. This is why I am currently working to create such a weapon system, so that one day The United States military might have a new tool to fight wars with. A tool that could save lives. This is what I want to create and this is what all my robotics work and projects will be in the pursuit of from this point forward.